Have you ever wondered visiting Norway’s Tautra island, New Delhi, Sao Paolo, Beijing, and London in just one hour? Well, it seems impossible but a British artist Michael Pinsky somehow made it possible with his newest work, virtually. 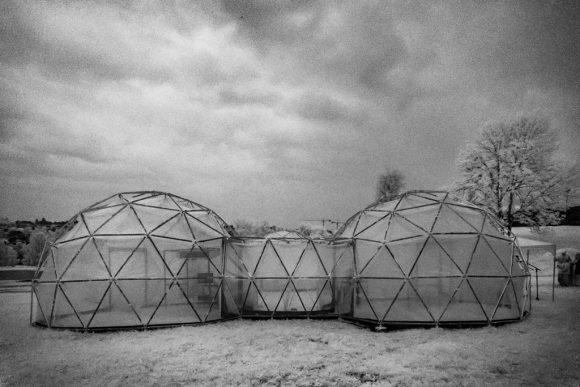 Pinsky built an architectural work inspired by the works of Buckminster Fuller, a notable architect and environmental writer who pioneered geodesic dome. Converting the inspiration into his own creation, Pinsky is building “pollution pods” in the middle of London. Starting from April 22, any visitors coming to and local people living in London is given the chance to ‘visit’ those cities. The pollution pods actually will not give you the experience visiting those famous cities’ attractions, but at least will give you the experience to feel the air quality in those cities. It might not give you beautiful background for your selfies, and that is never going to be the purpose of it in the first place. But you are expected to be more aware of air pollution that happens in our cities, compared to the pure and fresh Tautra island’s air. 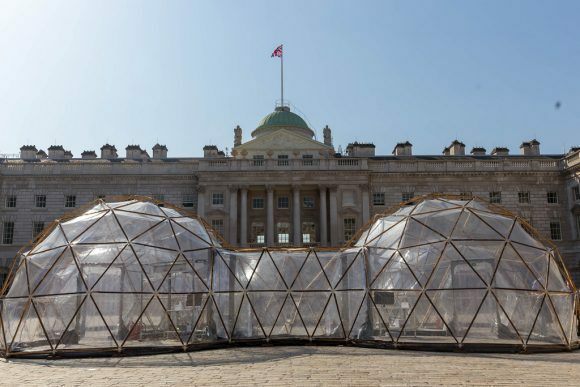 The exhibition of pollution pods in London will be the second exhibition of the artwork, after similar project has been exhibited in Trondheim back in June 2017. Trondheim was chosen to be the perfect place to hold the first exhibition since it is near to the ‘fresh air sample’ island, Tautra. Like mentioned before, the work of Pinsky will not give you selfies with beautiful scenery of those cities. The point is, the artist expects you to compare how much differences you can notice between the pure and fresh air in the Trondheim, that will be included in one of the pods, and those mentioned big cities. Pollution pods installation is the climax of Climart project, a scientific project aimed to see whether visual arts can affect our perception toward pollution and climate change. 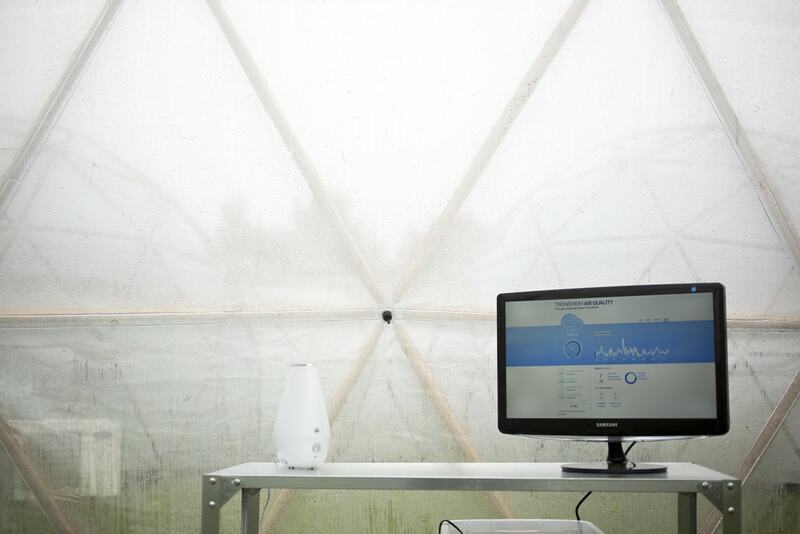 This project has been supported by Norwegian University of Science and Technology (NTNU). “My job is to do an artwork in the way I always do and not to alter it because of the study, otherwise it makes the study unsound,” said Pinsky whose artwork proposal has been chosen as the one to be supported by NTNU among other 120 submissions. April 22 was chosen to be the perfect date since the day will be celebrated by people all around the world as the “Earth Day”. Instead of celebrating it with balloons, which will be polluting our earth more, every person in London can just visit the artwork. Pollution pods can be said as an artistic way to campaign the challenging and controversial topic, climate change and pollution. Campaigning through artwork is pretty common nowadays, and Pinsky himself identifies as one of those artists to be included in the motion. “My work has always been quite political. My primary objective is about pushing the boundaries of what art can do and how it functions on a political, intellectual and aesthetic level,” the artist told CNN. This way, he wants his artwork not only appreciated as a mere art, but also a propagator for public to realize how much damage we have caused to the earth. The Climart team, as the main sponsor of this eco-consciousness-based art project, have done a series of works to choose the most effective artwork to be presented. They have worked since 2015 during the ArtCOP festival in Paris and measure almost every single detail of the suggested concepts as far as measuring brain activity of selected participants. And after more than 2 years of tight selection process, in June 2017 the team led by Christian Klockner chose Pinksy to be the one participating in their project. Not only because Pinksy himself has always been quite political in his works, but also because the artist has impressed them with the concept of pollution pods. Not only having sole purpose to be an artwork that show the visitors global condition of air pollution, the pollution pods project in Trondheim has also acted as an effective data collector for NTNU’s study. The visitors required to fill an extensive survey which was collected and analyzed by the researchers. But before filling up the survey, the visitors were asked to experience the bad air condition in New Delhi, smog in Sao Paolo and Beijing, and vehicle pollution in London by entering each pod. Before and after entering those pods, the visitors need to deeply inhale the diesel engine pollution in Trondheim for comparison too. “So far in our studies, we have found that artists are increasingly responding to the threat of climate change within their work. What we expect to see in this project is that art, which is less dogmatic than scientific texts or political discussion, speaks to people on a more emotional level,” said Klockner. By embracing two aspects of human tendency, science and arts, they hope the message will spread faster, wider and more effective. Not only that, by showing public that arts and science can go hand in hand in this project, Klockner and Pinksy hope that their coalition will inspire future similar coalitions. “The most important thing in this project is to understand whether art can change the behavior of people and perhaps, from our studies, artists will take up our ideas and use them in the creation of new art pieces,” Klockner said. Being the second exhibition of his pollution pods, the exhibition in London also includes additional features. The first is Choropleth, a color-changing flag which will be standing alongside the pods that will change color based on the amount of ultraviolet radiation it receives. The flag will have a Union Jack pattern and color at first, but after exposed to some amount of ultraviolet light from the sun, it will change its color in real time from the original red, white and blue to grey and black. Not only that, the exhibition will also feature Somerset House’s secret coalholes which will give the visitors information about mushrooms. Visitors can explore the coalholes to witness how mushrooms are being grown, thanks to educational project brought by Edible Utopia. So, if you are planning on visiting London this week, make sure to not miss the Earth Day exhibition by Pinksy.